The way to make your trip of a lifetime even more amazing is to share it with family, friends and close associates while having the entire yacht to yourself. Both our yachts are available for private charters. M/Y Grace: Available for up to 18 guests on 9 cabins. M/V Evolution: Can be chartered for as few as 24 passengers in 16 cabins, and you can incrementally add up to 8 more passengers for a total of 32. Having the yacht to ourselves made us enjoy every moment with our family and friends. The Galapagos cannot be a better place to share with your loved ones. On a private charter your party will be the only passengers aboard the yacht making for a more exclusive experience when you visit landings and snorkeling sites. You can relax and share memories in the familiarity of those you know and care about most. When you charter the entire yacht you will enjoy significant savings over booking individual cabins at retail. This is one way we reward our chartering passengers. You can charter the Grace for 18 passengers. Aboard the Evolution you can charter the yacht for as few as 24 passengers and add up to 8 more incrementally, giving you flexibility in the size of your group and pricing. In the past, at our passenger's request, we have staged large birthday, anniversary and other landmark celebrations for our chartering guests. Our friends and group charters are ideal for those looking to see the Galapagos in a more intimate-shared adventure. These charters include wine-tasting nights, special lectures, special menus and more. Sharing and unforgettable adventure with your loved ones. Child-oriented naturalist, activities and menus for children onboard. Where else can all three generations do the same thing at the same time while enjoying peak life experiences like snorkeling with sea lions and penguins or encountering a giant tortoise in the wild! We customize our expeditions for the special interests of photographers, bird-watchers, foodies, geologists and more. You will be accompanied by an expert in that field. We will be glad to obtain all local permits for your arrival on your private jet. Our staff is devoted exclusively to you. Special requests for activities, food, beverages, liquors, etc. can all be taken care of for charters. A charter equals an even more tailored, flexible and one of a kind voyage to suit your itinerary, activities and style. Let us help you take the private trip of a lifetime. Affinity groups from all over the world, linked by a common interest or purpose, are hosted by Quasar Expeditions on highly tailored departures throughout the year. The level of personalization and detail that goes into these affinity group experiences is truly unrivaled. Several times a year, inspirational individuals and renown world scholars from all over the world are invited on specific chartered departures. The fortunate few to accompany these amazing individuals on our different destinations, experience a whole new dimension on their expedition. Stanford University and the University of Notre Dame, two of the most prestigious Universities in the United States, have some of the most successful Alumni Travel programs in the Nation. Quasar Expeditions is proud to be the leading choice for these two Universities when it comes to Galapagos travel. Richard Dawkins, an English ethologist, evolutionary biologist and author, which many have labeled as the Charles Darwin of today, has been leading chartered departures with Quasar Expeditions as a guest speaker in the Galapagos Islands. 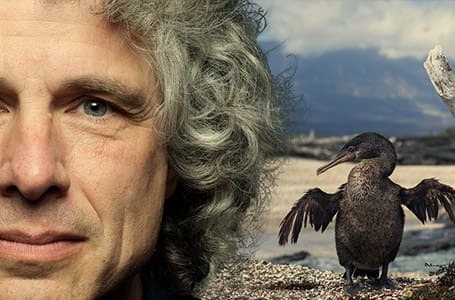 Steven Pinker, a professor at Harvard University known for his advocacy of evolutionary psychology and the computational theory of mind will be the leading speaker in a departure with Quasar Expeditions. Choose the right add-ons for your Ecuador & Galapagos adventure. Lunch at Galapagos Safari Camp (the day you enter Puerto Ayora).